For the second year in a row, a Webster Thailand student is presenting at the Advances in Hospitality and Tourism Marketing and Management (AHTMM) Conference. 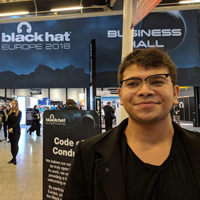 Last summer, former MBA graduate student Rituraj Bhuyan presented his research in Bangkok on the influence of management practices on turnover in a five-star hotel. This year MBA graduate student Sirilak Khetsoongnoen has been accepted to present her research at the 9th AHTMM Conference, held this summer in Portsmouth, England. Webster University Thailand hosted the Russian Ambassador to Thailand for an afternoon of discussion at the Bangkok Centre, Empire Tower. 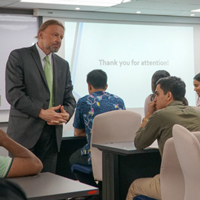 Kirill Barsky provided students and other attendees an overview of the key subject areas of concern to the interests of the Russian Federation and with a explicit goal of outlining how things look from the Russian perspective. This was a useful – and challenging – exercise given the diversity of nationalities who attended from the Webster Thailand community. Marianne Grant, studying at the Vienna campus, has been selected as the winner of the 2018 Graduate Thesis Award in International Relations for "Buying Time: The Effect of Costly Signaling and Interdependence on Low-Conflict Duration." Webster Thailand student Len Thanh Vu received a certificate of honorable mention. The Graduate Thesis Award in International Relations is given annually to recognize individual excellence in student research. 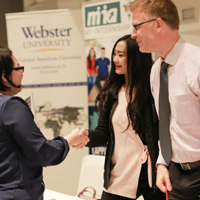 Webster University Thailand’s biannual Career and Internship Fair was held at the Bangkok Empire Tower campus on Wednesday, April 4. The fair provided students with an opportunity to discuss internship and employment opportunities with a range of well-known exhibitors. With 31 exhibiting organizations working both within Thailand and other countries within the region, students had no shortage of fascinating employers on hand to discuss their future career aspirations. 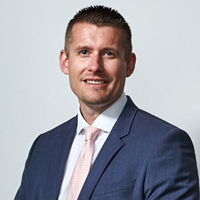 Ryan Guffey has been appointed as director of Webster University Thailand, as announced by Peter Maher, associate vice president of Academic Affairs, International Campuses and Initiatives at Webster University in St. Louis. Guffey will begin his new role on June 8. "Ryan has significant experience with U.S. higher education, and his international experience aligns very well with Webster’s global strategy," Maher said. 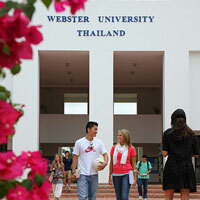 With more than 80 percent of students at Webster University Thailand’s Bangkok and Cha-Am campuses coming from abroad, Webster consistently encourages the showcasing of Thai language, culture and tradition wherever possible. To this end, Ajarn Kulavir from the "Thai Ways" class, organized a weekend trip to the Amphawa District. 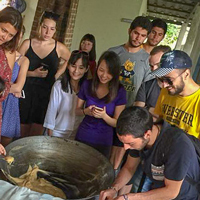 Students learned Thai cooking, saw some of Amphawa's famous sites and even learned the significant role the simple coconut plays in everyday Thai life. 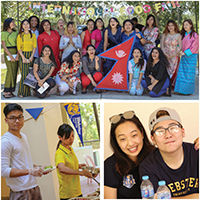 Co-organized by the Student Government Association (SGA) and Student Affairs, the event provided a unique opportunity for a number of Webster’s international students to cook, sell and showcase their national cuisines. This year saw a range of delicious foods and desserts on sale from countries both within Asia and across the globe. 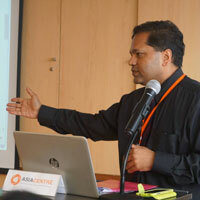 Some of the countries represented included Thailand, Nepal, Bhutan, Myanmar, India, Pakistan, Sri Lanka, Singapore, South Korea, Turkey and the United States. Webster Thailand Students Perform "The Virtuous Burglar"
Students from Webster Thailand delivered a memorable performance of "The Virtuous Burglar." 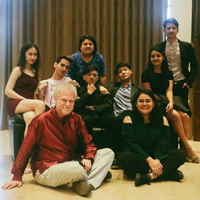 Held at the Sala@Hua Hin conference hall, the play was directed by Webster Thailand's campus director, Keith E Welsh. The Virtuous Burglar, a satirical one-act play, is one of playwright Dario Fo’s most famous works. 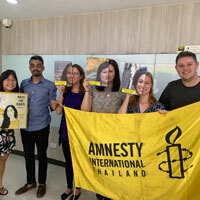 Webster University Thailand and Mahidol University recently collaborated on a one-day training seminar for undergraduate and graduate students from both Mahidol and Webster Thailand as well as PhD candidates from Mahidol’s Human Rights and Peace Studies program. 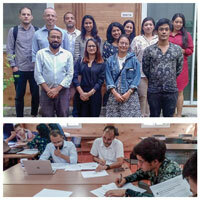 Participants were introduced to the principles of conflict mapping which serves as a transferable and practical rubric for the analysis of social conflict in a range of settings. 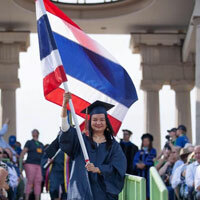 The Webster Groves campus will host a candidate interviewing for the position of Director of Webster University Thailand on Monday, March 5. Faculty, staff and students are invited to attend an open forum with the candidate at 2:15 p.m. in the Library Conference Room. Information on the candidate will be shared there, and attendees are asked to fill out a feedback survey afterward. The Webster Groves campus will host a candidate interviewing for the position of Director of Webster University Thailand on Tuesday Feb. 20. Faculty, staff and students are invited to attend an open forum with the candidate 11 a.m. - 12 p.m. in the Library Conference Room. Information on the candidate will be shared there and a feedback form made available through Webster Today. 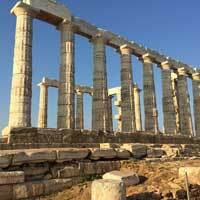 An information session for Summer Study Abroad will be held Monday, Feb. 12, from 5-6 p.m. at the Pearson House, room 2. Students will learn about study abroad research opportunities, including coursework, research and field trips, research projects, special scholarship and other funding opportunities. The session will cover two unique research focused programs: "Thailand: Inequality and the Environment" and "Athens: Global Health and Inequality."